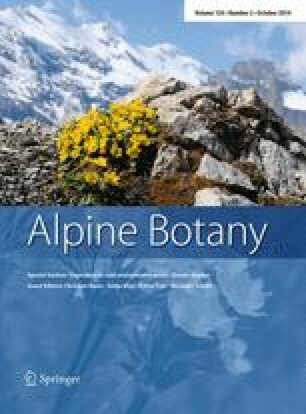 We experimentally imposed three different kinds of warming scenarios over 3 years on an alpine meadow community to identify the differential effects of climate warming and extreme climatic events on the abundance and biomass of bryophytes and lichens. Treatments consisted of (a) a constant level of warming with open top chambers (an average temperature increase of 1.87 °C), (b) a yearly stepwise increase of warming (average temperature increases of 1.0; 1.87 and 3.54 °C, consecutively), and (c) a pulse warming, i.e., a single first year pulse event of warming (average temperature increase of 3.54 °C only during the first year). To our knowledge, this is the first climate change study that attempts to distinguish between the effects of constant, stepwise and pulse warming on bryophyte and lichen communities. We hypothesised that pulse warming would have a significant short-term effect compared to the other warming treatments, and that stepwise warming would have a significant mid-term effect compared to the other warming treatments. Acrocarpous bryophytes as a group increased in abundance and biomass to the short-term effect of pulse warming. We found no significant effects of mid-term (third-year) stepwise warming. However, one pleurocarpous bryophyte species, Tomentypnum nitens, generally increased in abundance during the warm year 1997 but decreased in control plots and in response to the stepwise warming treatment. Three years of experimental warming (all treatments as a group) did have a significant impact at the community level, yet changes in abundance did not translate into significant changes in the dominance hierarchies at the functional level (for acrocarpous bryophytes, pleurocarpous bryophytes, Sphagnum or lichens), or in significant changes in other bryophyte or lichen species. The results suggest that bryophytes and lichens, both at the functional group and species level, to a large extent are resistant to the different climate change warming simulations that were applied. This article is part of the special issue Vegetation in cold environments under climate change. The online version of this article (doi: 10.1007/s00035-014-0133-z) contains supplementary material, which is available to authorized users. The authors thank two anonymous reviewers and Christian Rixen for their comments that improved the manuscript. We thank the staff of Abisko Scientific Research Station for help and hospitality, Vivian Aldén, Björn Aldén and Olga Khitun for assistance in the field. This study was supported by an NFR grant (B-AA/BU 08424) to UM.